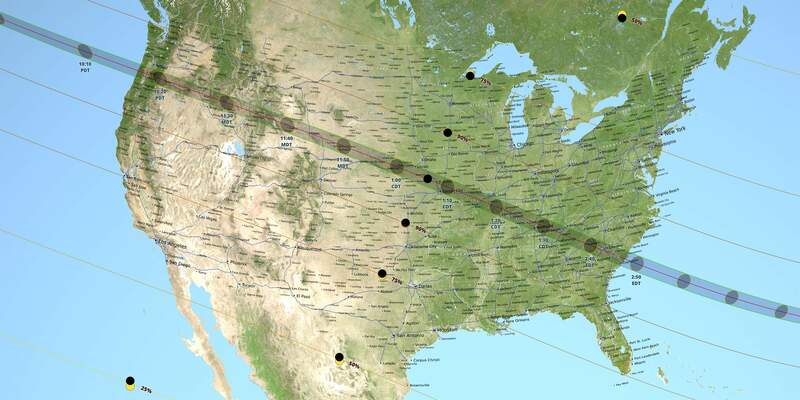 There will be a total solar eclipse on Monday, Aug. 21, 2017, and the United States will be the best country to watch. It will be also the first total solar eclipse to go coast to coast in the U.S. in 99 years. From Oregon to South Carolina, 70-mile Moon-shadow will race across the U.S. and it will completely block out the Sun for a few minutes. It’s still more than seven months away, but hotels already are selling out as people prepare for the rare and amazing event. A solar eclipse is a type of eclipse that occurs when the Moon passes between the Sun and Earth. A total eclipse occurs when the dark silhouette of the Moon completely obscures the intensely bright light of the Sun, allowing the much fainter solar corona to be visible. During any one eclipse, totality occurs at best only in a narrow track on the surface of Earth. If the Moon were in a perfectly circular orbit around Earth, a little bit closer, and in the same orbital plane, there would be total solar eclipses every month. However, the Moon’s orbit is inclined (tilted) at more than 5 degrees to the Earth’s orbit around the Sun (ecliptic), so its shadow at new moon usually misses Earth. Warning: Looking directly at the sun is unsafe except during the brief total phase of a solar eclipse (“totality”), when the moon entirely blocks the sun, which will happen only within the narrow path of totality (see the map above). The only safe way to look directly at the uneclipsed or partially eclipsed sun is through special-purpose solar filters, such as “eclipse glasses” or handheld solar viewers. Homemade filters or ordinary sunglasses, even very dark ones, are not safe for looking at the sun. Rainbow Symphony CE Certified Safe Solar Eclipse Shades (you can buy from Amazon). According to NASA, as of January 2017, only three manufacturers have certified that their eclipse glasses and hand-held solar viewers meet the ISO 12312-2 international standard for such products: Rainbow Symphony, American Paper Optics, and Thousand Oaks Optical.